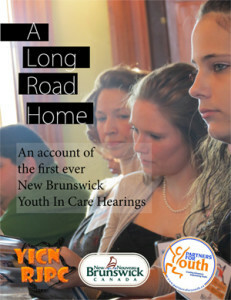 On 29 November 2012, members of our New Brunswick Youth in Care Network (NBYICN) organized the first ever provincial Youth in Care Hearings. The hearings were an opportunity for people who had grown up in the care system to speak to government officials and policymakers about their time in care. It was a day filled with raw emotion and fruitful discussion. The first section provides a summary of the conversations NBYICN leaders had with various stakeholders during our 2012 consultation process. In particular, this section details the results of conversations we had with three key groups: social workers, foster parents, and adoptive parents. We have also included a summary of key points raised b our own network members over the course of many internal conversations and meetings. The second part of the report includes a list of recommendations for government. These recommendations are the result of many hours of deliberations and discussions. In this, we have attempted to boil down our recommendations to a relatively short list of things we feel would be very possible to accomplish and very beneficial to youth in care. Welcome to the PFY Family!